NEW Tianjin Explosion Two Months after Megablast. Raw footage of the new fire in Tianjin following another mystery explosion. Fresh Tianjin blast two months after mega-blast killed 173 in the city. Two months after the Tianjin Port was struck by a small nuclear weapon that killed at least 173 people, another Tianjin warehouse has exploded. The incident took place late on Monday night or in the early hours of Tuesday morning. There are no reports of casualties. Counting from the explosion in Shandong on July 17th, exactly a year after the MH17 false flag terror attack there have been six highly suspicious industrial incidents in China in less than three months. In addition there were the spate of mystery explosions in Guangxi last week. The lack of information on the latest Tianjin explosion is most frustrating and it is regretted that a fuller account is not available at this time. Visiting the China Peoples Daily I could find no reference to the story and an in-site search on Tianjin fire produced only results related to the August event. They are quite literally the only specific details about this I could find on the internet at this time. 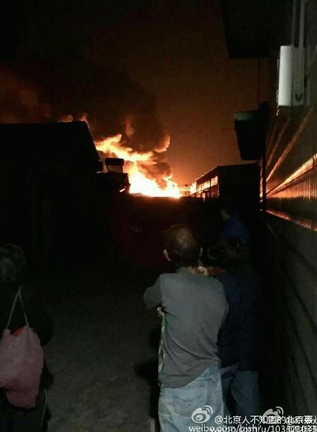 Massive Fire Burns After Another Explosion Rocks Tianjin Warehouse | Zero Hedge. 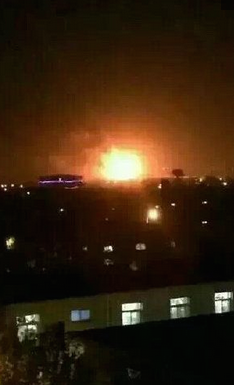 Vision of the fresh blast in Tianjin from the twitter feed of Chinese state television.